A man tried to save a lorry driver trapped inside the burning cab of his vehicle, a fatal accident inquiry (FAI) has heard. 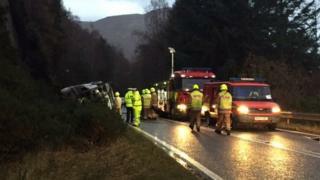 John Bellshaw, 63, went to the aid of Steven Mitchell, whose lorry had overturned on the Ullapool to Inverness road on 19 December 2015. Mr Bellshaw told the inquiry into the 48-year-old driver's death how he fell from the fuel tanker. He also told the FAI of hearing Mr Mitchell's cries for help. Mr Mitchell's vehicle had overturned onto the driver's side, the first day of the inquiry at Inverness Sheriff Court heard. Mr Bellshaw said a woman had been the first person at the scene and she told him the driver was still in his vehicle. He said: "I went to the passenger door and couldn't see inside. The cab was full of smoke. "I didn't have a fire extinguisher or a fire blanket so I went to the front of the lorry to see if I could get in that way. "I knew I couldn't get in through the windscreen but could see the engine compartment was on fire. "I climbed on top of the tanker in the hope of getting in the passenger door. But I couldn't. "Then the lady who was on the phone said the police had told her to tell me to get off." Mr Bellshaw said that was when he fell under the tanker on to bushes. "I said: 'I am trying.' I couldn't see what was trapping him. His back was against the window. He couldn't get out and I couldn't get in. "The fire was now substantially totally different inside from what I initially saw from outside. I then climbed out over the top of the tanker, and found a fire extinguisher in a compartment of the lorry. But it wouldn't work when I pressed the handle. "But I don't think it would have made any difference by then. The fire was beyond an extinguisher. It went from a fire to an inferno." Mr Bellshaw said it was then that he realised he himself was in danger. He said the fire "escalated quickly". The inquiry was told that the retained fire service unit from Ullapool arrived at the scene. Malcolm MacLeod, a firefighter of 26 years service, said: "We were there within eight or nine minutes of the call. We didn't expect a fire but were prepared. "We weren't sure what the tanker was carrying, whether it was empty or full and the hill above it had caught fire as well. "It took us 30-35 minutes to extinguish the blaze." He explained that he and his crew could not get near the vehicle to save Mr Mitchell. Mr MacLeod said: "It was impossible. The cabin was completely orange - it was in flames. We had to stay 50ft away from it in case of an explosion."